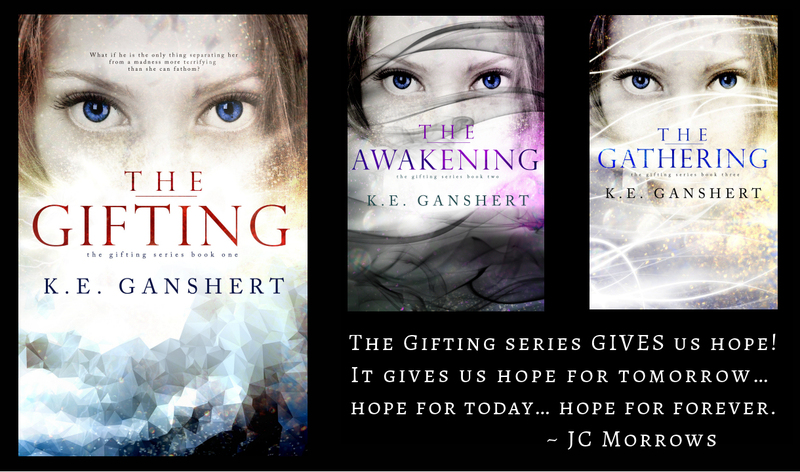 Recently I read The Gifting series by K.E. Ganshert. And yes, I reviewed all three books on my review blog – where… yes, I gushed! And now I’m trying to get back to my own writing… the key word there: trying. I have to wonder if one of the reasons I love the series so much, is because of how much I identify with Tess. I have never thought I was worth much… not attractive, not super intelligent, not special in any way. And now I have the added stress of thinking about the AMAZING book series I just finished and I worry that my own stories will pale in comparison. I closed the cover on my iPad the moment I finished and rushed to the computer to write my review while the story was fresh in my mind. I floated on the exhilaration of finishing a book series that has changed my little world – for a time. But reality always comes crashing back in at some point – and in my case, that reality came with the certainty that I can NEVER measure up! I am not just feeling sorry for myself. Yes, I realize that our two series hold very little similarity. K.E.’s is about a very supernatural world and amazing fighters and mine is about an assassin who falls in love with her target – but they’re both within the realm of Speculative fiction and they’re both Young Adult so there are some parallels. And I KNOW I’m not the only author who compares her work with others. It’s all well and good to say we shouldn’t but let’s face it – we’re human. Some of us just can’t help it. And so, I have to remind myself to do the BEST that I can do and leave the rest up to God! He gave me the story! He gave me the words! He clearly has a plan and I just need to stick with it!